Springbok's myth-busting stories and videos explore the facts behind fables. Which big South African cat doesn’t roar? What are crocodile tears? 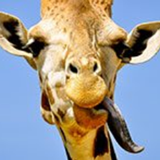 Can a giraffe lick its own ear? Do ostriches really bury their heads in the sand?! All through November, there’s also an Animal Facts casino bonus featuring free spins on RTG's very popular Kung Fu Rooster slot. Created to celebrate the Chinese Year of the Rooster, it has Wilds that double wins and scatters that can trigger up to 25 free spins with up to 25X multiplier. Springbok frequently shares video collections about South Africa. In May, its Heroes feature paid tribute to the heroic people that protect South Africa’s wildlife from poachers. Before that the South African casino shared stories of Unusual Friendships that developed between rescued animals in care. August was Wine Month and Van Wyk gathered a series of videos exploring South Africa’s famed wine regions. Free spins on Kung Fu Rooster slot from Realtime Gaming available until November 30th. At South Africa’s favorite online casino, all games are played in Rands and customer service is available in English or Afrikaans. Bitcoins can now be used for casino deposits and withdrawals. The casino offers hundreds of games including the bewitching new Bubble Bubble 2 which arrived just in time for Halloween. It’s in the download and instant play casinos for desktop and laptop computers and in the mobile casino for smartphones and tablets.